Jason Sosa started 2015 as a popular local fighter with a strong record and an 8-bout knockout streak. He continued to stop every opponent put in front of him and stretched his KO streak to 13. Among the opponents he kayoed in the first five fights of the year was Texan Jerry Belmontes, a world-class fighter who had fought for a world title. Sosa blasted him out in the first round. This was a huge victory, but may not have been enough to earn Sosa the Breakout Award. So Jason put the nail in it last December when he faced undefeated Nicholas Walters, a champion between titles and pound for pound contender. Few gave Sosa much chance of even surviving the ten round distance. However, with a national TV audience watching on HBO, Jason went toe to toe with Walters and earned a majority decision draw from the official judges. Now, many disputed the decision, the first smudge on Walters’ sparkling record. But that wasn’t the point. With his performance, Sosa proved that he belonged on the big stage – win, lose or draw. He displayed skill, toughness and desire, and after ten exciting rounds, put himself of the map. The choice of Jason Sosa as the fighter to make the biggest “breakout” in 2015, was clearly validated this past June when in his next fight he upset Javier Fortuna to win the WBA junior lightweight world title. That fight didn’t play into this award. It just set Sosa up for potential honors at next year’s event. The “Breakout Fighter of 2015” award is sponsored by Peltz Boxing Promotions. 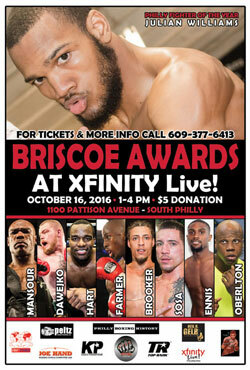 Come out to support Jason Sosa, the other winners and the rest of the Philly boxing community on Sunday, October 16, 2016, 1-4 pm at Xfinity Live! In South Philadelphia. Admission is $5.